This isn’t the easiest story for me to tell, but I wanted to be open with the KRose community about how I got here and why I decided to start my business. I wanted to create a company that allowed my employees and myself financial and time freedom. I want my employees to have a sense of security if they get sick or a family member gets sick, that they don’t have to fear they will lose their job. I needed a career that would work around what is best for me. When I got sick, I didn’t know what life would look like and I had to define a new reality. 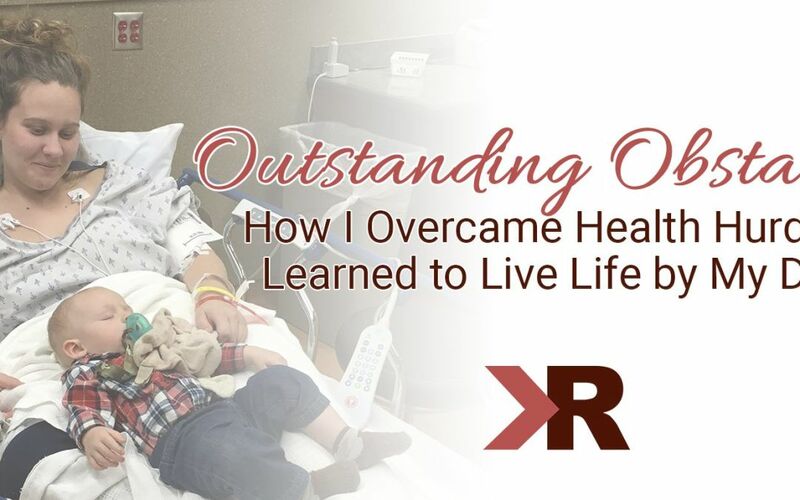 This is my story of declining health, near-death experiences, acceptance, and the will to move forward and make a difference. It was the Fall of 2009 and I was in my senior year of high school, running varsity cross country, playing basketball, and really starting to not feel well. The school year had just progressed into the fall. By the time October hit, I was feeling worse and worse every day. I was training harder in cross country, but my times were getting steadily slower. It was starting to get very frustrating. When I would eat lunch, the stomach pains to follow were extreme. I would try to sleep in my vehicle during the period after lunch, but it got tougher to endure each day. During this time, it felt like I wasn’t really living. I was exhausted and just trying to get through each day, barely surviving. My parents had started taking me to doctors who were continuously stumped. I went to a chiropractor who said my back was off and gave me some exercises. Then I went to a neurologist who diagnosed my chronic headaches and put me on medicine. But we still couldn’t pinpoint what specifically was wrong. I just knew I wasn’t feeling well, and it wasn’t getting any better. There were a few personal turning points when I knew something was really off. In welding class, I started to drop the welding equipment and couldn’t hold a grasp. It was like I was losing control of my grip and it was pretty scary. During basketball practice, I ended up having a stroke and they took me to urgent care. There they said I needed to see a neurologist right away and they thought I had swelling in the blood vessels of my brain. Within a couple days we were headed to the nearest neurologist in Helena. The nurse there told me I needed an MRI so they could find out what was going on in my brain. She said she wasn’t too worried about it and they gave me some medications, saying it should be OK.
We woke up the next morning and headed to Bozeman for an MRI. They called to say there were some abnormal results on the MRI and they needed me to come back to have the test done with contrast. Within the 30 minute drive home, they called and said we needed to go to Billings the next day. The next morning, December 18, my parents got a flat tire on the way to Billings and my dad was outside changing it when the neurologist called to check in. During the phone call I had a stroke. She hung up with me and called my dad outside to tell him what was happening. She told him to get me straight to the emergency room in Bozeman. I stayed there all morning as they performed test after test, with little progress into finding out what the problem was. A gentleman came up to my dad and said, though he knew it was against hospital protocol, that he wanted to take a look at me. He didn’t work at the hospital, but was interviewing for a job, coming from Seattle Children’s Hospital. He came in and immediately looked at my fingers and toes where he found splinter hemorrhaging, which is small blood clots that look like splinters. There are two reasons someone might have splinter hemorrhaging, either IV drug use, which of course I wasn’t doing, or a heart infection. The gentleman walked out and told my dad I needed to go to Salt Lake City. My dad, being John Rose, said, “Well, that’s fine. I just need to go home and shower and I’d be happy to take her to Salt Lake.” The man said he didn’t think my dad understood and that he had already called a life flight to take me to Salt Lake that night to prep me for open heart surgery. The memories are pretty vague from this time, but I remember friends, classmates and siblings coming in to visit me. The hospital allowed one parent to go with me on the flight and one to make sure I arrived there safely as I was one stroke away from serious damage or even death. I’m incredibly blessed and have had the most supportive friends and family throughout everything. My grandparents and some family friends beat us there to the waiting room. The plan was to perform open heart surgery, but the University Hospital surgeon told my parents we should fight it. Most people with endocarditis have lost about 50% of their body weight by the time it’s caught. They usually aren’t strong enough to fight the infection, which is why they go in and replace the mitral valve. As my dad lovingly describes, the doctor said I looked “so plump” that I might be strong enough to fight the infection. If they had gone in and replaced the mitral valve, it would have to be replaced often. After about 4 or 5 days in the Head Trauma Unit in SLC, they put in a PICC line, which is an IV straight to your heart. We were ready to go fight this heart infection with a new game plan. At that point, I thought I was going to start feeling better. To give you an idea of how powerful the antibiotics I was given were, they were $749 a day. But unfortunately, I was feeling anything but better. About a week after getting home, I started experiencing bad, writhing chest pain that kept me in bed. We called 911 three or four times, but still couldn’t figure out what was happening. With a heart infection, the pain was really scary on top of the extreme discomfort. By the end of January, the antibiotics had affected my gallbladder and I was admitted to the hospital for its removal. I remember seeing on the whiteboard, “Weak. May die”, and I can vividly see the handwriting to this day. I had told myself, we’ve overcome these two big hurdles, and I should start to feel better soon. But again, I didn’t really. I vaguely remember travelling with the basketball team and finishing my half credit remaining to graduate. But it was mainly a blur, I graduated high school, and I was still feeling miserable. The Salt Lake City Hospital called and said I needed to come back to figure out what was going on. The day before my 18th birthday we headed down to Utah and on my 18th birthday I was diagnosed with a blood clotting disorder. I started on the blood clot medication and overnight my life became better. It was great and I thought I had essentially conquered the hardest times. I went off to Kansas State University, but my body had just been through a very rough experience, and I wasn’t ready to fight contagious illnesses. I was getting really sick often and came back to Montana State University. When you’re on blood clotting medication, it can be difficult to regulate. I continued having strokes and landing in the ER, approximately once a month for the first two years of college. Doctors kept looking at my brain and seeing evidence of another stroke. It felt like we weren’t making much progress. By my junior year of college, I finally decided I’d had enough. This is my body and I’ve had the incredible gift of surviving more than 30 strokes. I kept saying to myself, this is my life, I’m in control, and I need to take initiative. I started eating healthier, paying close attention to my medication, and really listening to my body. Fortunately, I’ve been fairly health since my junior/senior year of college and this is when the dream of KRose came about. I started to see graduation on the horizon and was blessed to receive wonderful 6 figure job offers, with good health insurance that I knew I needed. But I was petrified. What happens if I’m not feeling well? With a brain that’s had stroke damage, there are some days I get migraines, there are days if I’m going too hard, my body might need an extra day to catch up. What happens if I’m in an 8 to 5 and I can’t work the whole day? I know you get sick days, but I still couldn’t do it. I needed something to give me some time freedom. We talk about this term time freedom, but what does it really mean? To me, it means I get to go to my 6 month neurologist check ups to make sure I don’t have any new stroke symptoms — that the left side of my body and my grip isn’t getting any weaker and that my eye drop isn’t any lower. If it’s in the middle of the day, it doesn’t matter. I can schedule my day around it. Time freedom also means if I’m not feeling well and need to call the hematologist to have more blood tests, I can drop everything and go in because I’m in charge. I don’t say that to brag, but because it’s a huge blessing. That is the reason I started the company, because I wanted to give myself those freedoms, but I also wanted to give the KRose team freedom. There are many weeks I work more than the 8 to 5 model. But there are also plenty of weeks that I’m fighting a cold, migraines, or my blood is either too thick or too thin. I might need to sleep in or take a day off to rest and eat a little differently. I needed to define my schedule and the freedom to work around doctor appointments. I remember being strapped to that life flight table and thinking I might not ever be able to work a normal day in my life. I’m one stroke away from becoming paralyzed, ending up in a wheelchair, being a vegetable, and not being able to work at all. There are days I complain because the KRose Company has growing pains and can be stressful. I know I don’t do everything right. But I am so humbled that my body and mind have given me the ability to run a successful company. Success looks different to me than it does another business owner. Success means that I have a brain that can process, that has healed itself and can come up with ideas, even after all of that damage. It’s incredibly powerful to me how far our body and minds can take us, and how incredibly they can heal. I know every day is a choice. I have to wake up and say, “I’m going to be a better person today.” I realize there is a reason I was given this battle to fight. I can’t say I know 100 percent why, but for some reason God gave me this one. I’m going to do the very best I can to empower others to know it doesn’t matter what’s been put in front of us. As cliche as it is sounds, I truly believe we can turn lemons into lemonade. We can take the bitterness out of life and make something sweet. What a journey, Karoline! I had no idea. I’m glad you’ve found a way to build a successful business you love and that gives you what you need! Wow, what an incredible story you have. Thank you for sharing it! I’m moved by how much gratitude you have for the life you’ve been given, that despite all the pain and hardship you’ve been able to appreciate and turn something beautiful out of it. That freedom of time is so crucial to quality of life, and it’s wonderful that you’re giving that to your team, too. Again, thanks for sharing so candidly with us! Thank you for sharing your story, it’s refreshing hearing good stories and people going forward positively into their future.